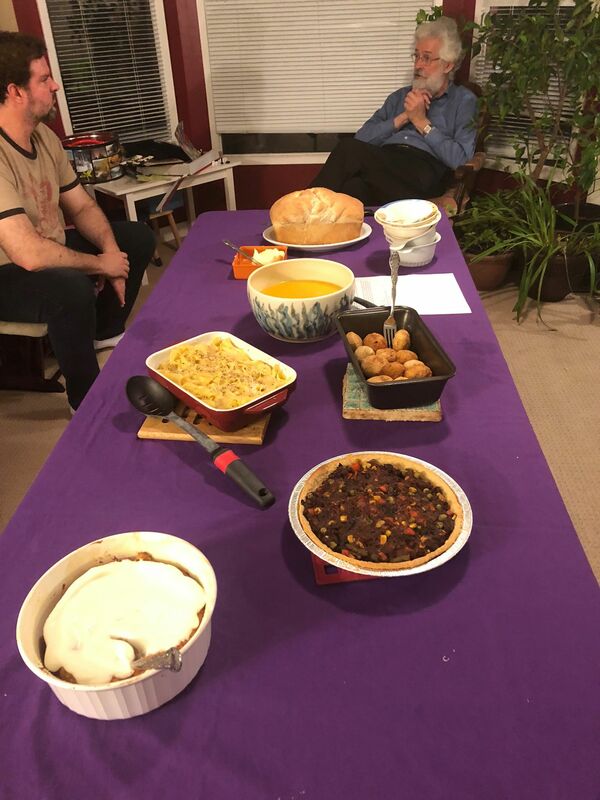 My first dish was a late 17th century carrot pudding, which I prepared based on a recipe detailed by the fabulous social history channel Townsends. If you haven’t come across this Youtube channel before, I highly recommend it! While they mostly focus on 18th century American history, their attention to detail (especially with cooking methodology) has been extremely useful in helping me think through food preparation in the 16th and 17th centuries. The carrot pudding is a pretty simple concept. You combine milk, honey, eggs, nutmeg, bread crumbs and grated carrot into a buttered dish and bake – the final consistency is pretty unusual, a bit like a very dense steamed pudding. It’s not nearly as sweet as a modern carrot cake-type dessert and I would sweeten it more if I made it again, but it was pretty good served with some whipped cream and the carrot taste wasn’t really apparent. Some of us had texture issues, but I quite liked it! There are similar recipes from earlier in time, some of which are encased in puffed pastry and seasoned with rosewater – try it out and let me know how it is! 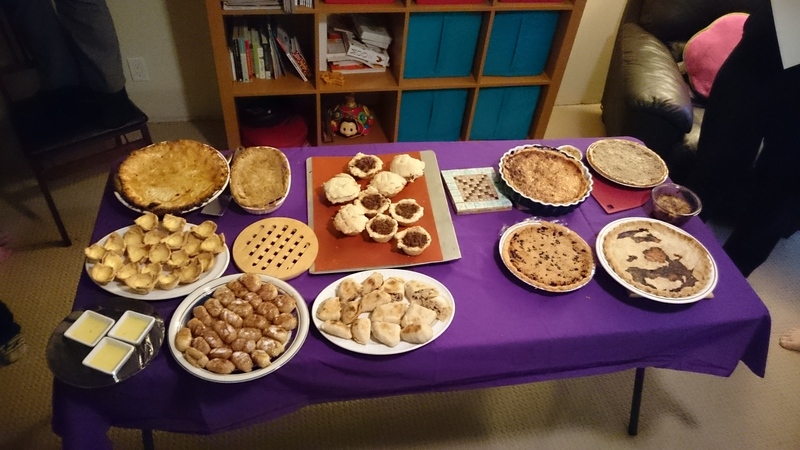 My second dish was more in period – “Macrows” from Forme of Cury, a very popular 14th century cookbook with reenactors and food historians. This is basically just thin, flat pieces of pasta (I chose egg noodles) layered with butter and cheese. I did mine with parmesan and cheddar and also added a little powder douce and black pepper, which are both featured in other similar contemporaneous recipes. It was super tasty, but the parmesan was really strong and the dish turned out very rich thanks to all the butter. Craig made a delicious pork pie with a variety of vegetables and spices; as he explained, it was common practice in parts of Italy to serve the night before’s leftovers as a pie the next day in the 16th century. I love a good thrift-conscious recipe! We also had a discussion about the inclusion of corn in this recipe. James mentioned that corn could be found in Rome as early as 1515, making it a much earlier ingredient to be found in Europe than some people might assume. Kat baked a delicious loaf of manchet bread with butter – I can’t think of anything more comforting! Simone’s contribution was “Tourteletes en Fryture,” also from Forme of Cury. They were basically delicious figs fried in saffron-colored pastry, and while they would have been a little better fresh, we found them really yummy even reheated. James brought a really unusual squash, almond milk and rosewater soup. The combination of flavors together was very reminiscent of the sweet red bean filling which is so popular in parts of Asia, and it was much sweeter than we would generally consider appropriate for a soup in this part of the world. It was delicious and a real conversation starter! All in all, we had a lovely evening of visiting and dining!